Brinda Dixit in Revel's End. BOTTOM LINE: A high-concept environmental theatre journey from a young and hungry creative team that transforms a Shakespeare classic into an energetic, ethereal dance party. The Woolgatherers’ Revel’s End: A Tempest Dance Party combines two powerhouses of theatre: Shakespeare and immersive theatre. With this production, the company breaks with Elizabethan convention to bring the text of The Tempest into a real-time revelry. This standing-room only show converts a small theatre space into a dance floor, then transforms it once again into an otherworldly island. The playing area is packed, with three small stages spaced throughout the house and one larger platform for bigger scenes. Actors are split physically in a way reminiscent of an island chain, and dash in and out of the stages with tremendous energy. The bar on the left and DJ booth on the right create a nice ambiguity between seedy bar and magical island. Remy Leelike’s set design completes the inviting look with fishing nets and lighting strands throughout. The overall effect is immersive, and the space undergoes a surprising transformation with little spectacle. A great deal of this is thanks to Leelike’s lighting design, which is precise and draws the eye while adding rich color to the room. Revel's End generally follows the plot of Shakespeare’s The Tempest, playing the narrative’s key scenes in traditional theatrical style while converting some to extended dance-party interludes. Revel’s End glosses over The Tempest’s slower narrative moments while hitting the high notes: Prospero (Bereket Mengistu) is a sorcerer and the rightful king of Naples, who traps his rival Alonso (Jaz Zepatos) and Alonso's crew on the island where Prospero and his daughter Miranda (Kanae Miyahara) have been banished. Zepatos also plays Prospero’s other rival, his slave Caliban, creating a parallel between Prospero’s enemies, real and perceived. During the tempest the crew falls into a series of tricks and shenanigans set by Prospero and his faithful servant Ariel (Brinda Dixit), while Alonso’s son Ferdinand (Will Van Moss) and Miranda fall in love. Particularly interesting is that Revel’s End double-casts two pairs of minor characters who collectively cause a lot of trouble: Elisha Mudly and Meghan Crosby, respectively, play both drunken crewmates Sebastian and Antonio, and scheming island sprites Trinculo and Stephano. Revel’s End interweaves the plot with the revelry until they are mostly inseparable, and the characters speak through choreographed dance as much as spoken word. In particular, Brinda Dixit’s Ariel punctuates every word with a danced gesture, adding to the character’s ethereal strangeness and quiet longing for her master. As Prospero, Bereket Mengistu is a force, elegantly whirling the chaos around him. Crosby and Mudly also stand out as high-energy troublemakers, moving the plot forward as a solid team. Overall, the entire cast carries an excellent chemistry and ensemble spirit that pushes the dance-party fervor. The play transitions between musical breaks and traditional scenes, a structure that is sometimes a bit stiff but generally works. At its best, the scenes break into the party in the way a particularly raucous night at a frat house might contain vignettes that momentarily steal the attention of the revelers. Revel’s End is a DJ set as much as a theatrical production, and composer/sound designer Jared Arnold’s original music is clever and varied. Often, singers riff off and repeat particularly poetic or alcohol-themed lines of Shakespeare’s text, and the ethereal, otherworldly techno tracks fit the theme well. The production devotes a lot of energy to the music, and the interplay between music and scene is carefully considered. The constant presence of sound adds texture and depth to the environment. The tactic of creating a party book-ended by scenes depends heavily, however, on a willing audience, and Revel’s End tries their best to get the audience up and moving. The production effectively uses the entire room, and actors are constantly moving through the crowd, trying to encourage folks to dance. In some ways, it’s a compliment to the rich acting skills of the cast that the audience largely stayed rooted to their place, not wanting to miss the start of the next scene by letting loose on the dance floor. 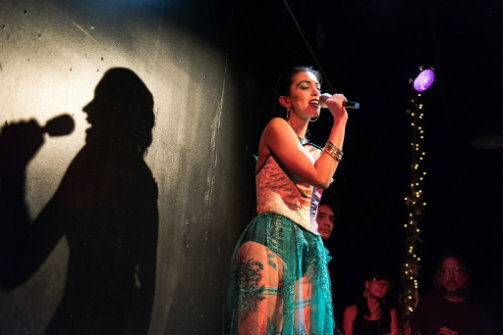 Getting an audience to cooperate in an environmental theatre space is always a challenge, and the cast and crew of Revel’s End set an ambitious goal for themselves in trying to convince an audience to party for the sake of theatre. While it seems counter-intuitive to call for "less theatre" in a production, it seems the Woolgatherers’ concept may require less of the traditional play’s structure and plot in order to give the audience less space to retreat into the familiar comfort of passively watching a play. Even so, as environmental theatre Revel’s End is an enjoyable immersion into a magical world, not to mention a high-quality performance of The Tempest that draws upon its central themes in a unique and satisfying fashion. This young company is thinking big and pushing their audience’s buttons, and it will be exciting to see what comes next. Revel's End: A Tempest Dance Party is created by Grace Herman-Holland, based on a play by William Shakespeare. Directed by Grace Herman-Holland. Vocal Coaching by Sarah Woolf. Set & Lighting Design is by Remy Leelike. Assistant Lighting Designer is Rebeca Schaefer. Sound Design & Composer is Jamie Gross. Costumer Designer is Jamie Gross. Stage Manager is Brendan Cullen. The cast is Bereket Mengistu, Brinda Dixit, Kanae Miyahara, Will Van Moss, Jaz Zepatos, Meghan Crosby, and Elisha Mudly.